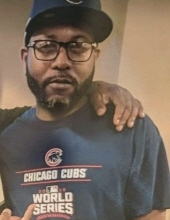 Celebrating the life of Gerald D. Archer Sr.
Obituary for Gerald D. Archer Sr.
Gerald D. Archer Sr., age 46, passed away suddenly on April 4, 2019 in Aurora, IL. He was born July 4, 1972 in Chicago, IL. Gerald is survived by his sons Gerald D. “Boopie” Archer Jr., Jeremy D. Archer, and Jeremiah J. Archer; grandson Gerald D. “Boopie Jr.” Archer III; parents Carla and Willie J. Archer; sister Krystal (Darrin) Fulcher; nieces and nephews Jasmine, Jermaine, Sharmaine, and Darrion. He is preceded in death by his brother Jermaine D. Archer. Visitation will be Friday, April 19 4:00-8:00 PM at Friedrich-Jones Funeral Home & Cremation Services 44 S. Mill St. Naperville, IL 60540. A funeral service will take place on Saturday, April 20 at 12:00 PM at the funeral home. To send flowers or a remembrance gift to the family of Gerald D. Archer Sr., please visit our Tribute Store. "Email Address" would like to share the life celebration of Gerald D. Archer Sr.. Click on the "link" to go to share a favorite memory or leave a condolence message for the family.